Located in the heart of the Hill Country, right outside of Fredericksburg, Texas on the famous 290 Wine Trail, Mendelbaum Cellars boasts a collection of over 20 varieties of wine, specializing in wine from the Holy Land. Refreshing whites, fruity roses and bold reds that are aged 18-24 months in French oak barrels to ensure the finest quality wines. 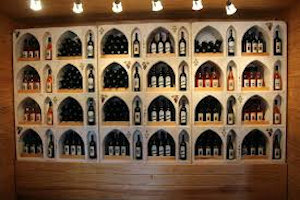 The tasting menu is divided up into three sections, with one list for $1 per wine, $2 per wine, and finally $3 per wine. The Mendelbaum Cellars wine was listed on the $1 wine list whereas the Inwood Estates and Vineyard at Florence wines were on the $2 and $3 lists. The normal tasting is $10 and you can mix and match to make up the number of wines tasted. Discover the rich history of 4,000 years of winemaking in the Holy Land. Knowledgeable staff will make sure you have an unforgettable and delightful time. Mendelbaum Cellars offers a wide selection of high-quality Israeli wine, rich flavorful Texas wines, and delicious Israeli extra virgin cold press olive oils.